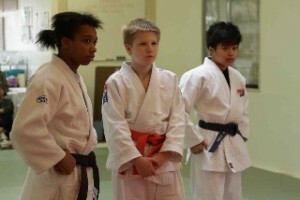 On February 11, 2012, Daiheigen Yudanshakai was honored to sponsor junior and senior judo clinics featuring 3-time Olympic Medalist and 5-time World Medalist Yoko Tanabe Sensei. 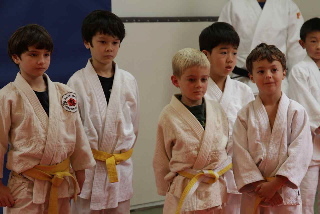 Held at East Bay Judo Institute in El Cerrito, the clinic drew 40 attendees from numerous dojos from the Yudanshakai, including Team Sacramento, Okubo, Makimoto Judo, and EBJI among others. In the morning session for the juniors, up to age 12, Tanabe Sensei focused on basic judo skills, with a warm, hands-on approach that kept all of the young judoka engaged and motivated. After a break for lunch, Tanabe Sensei reviewed more advanced, competition-oriented skills with the senior students, including her highly effective ouchi-gari to uchimata combination and an elegant entrance into shime-waza from her opponent’s standing attack. Each session ended with a few rounds of randori, where students had a chance to try the new skills that they had learned. Following the senior session, attendees had a chance to ask Tanabe Sensei questions about her experience as an Olympic and World medalist. Students were particularly amazed to learn that Tanabe Sensei started judo at the age of 18, and won her first Olympic medal a mere four years later! All in attendance were grateful for the opportunity to learn from one of the most humble and accomplished competitors in our sport.